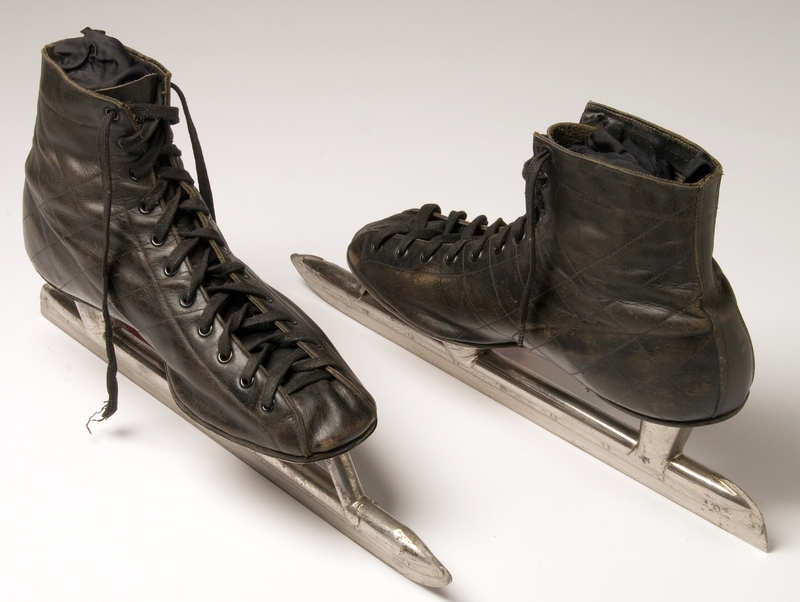 Ice hockey great, Wayne Gretzky, famously said, “I skate to where the puck is going to be, not where it has been.” That is great advice, when you are standing on an ice rink, and can see in advance every potential impediment that stands in the way of a successful pass. It is an entirely different matter when you are sitting at the table at the Federal Reserve, and it normally takes nine months or longer for your actions to fully impact the economy, and where there exists a constant inflow of new and often unforeseeable obstacles to deflect what months earlier had looked like a “successful pass”. Further, when you have a Federal Reserve that has been (quite appropriately) raising interest rates every three months, the existence of such an extended lag time means that the Federal Reserve could easily raise interest rates three or four times more than is necessary to moderate the economy, before it ever became even reasonably evident that they had over tightened and, as a result, slowed the economy by too much. The Fed is, in essence, charged with two conflicting mandates, as too much of either one necessitates that there be too little of the other. They are tasked with producing maximum sustainable levels of employment, while maintaining beneficially-low and sustainable levels of inflation. This is why they tap on the brakes via higher rates when the economy gets too hot, and vice-versa when the economy starts to slow too much. Ultimately, however, central bankers can’t repeal the business cycle, and can only hope to use monetary policy to moderate its amplitude, by restraining economic growth before inflation becomes an issue, and by trying to stimulate the economy just after its speculative excesses have been restrained, but before it slips all of the way into recession (the recovery from which has an equally long monetary policy lag time). It is no wonder that the blame for most recessions is, with the benefit of hindsight, ultimately laid at the feet of well-meaning but overly-restrictive monetary policy (i.e. 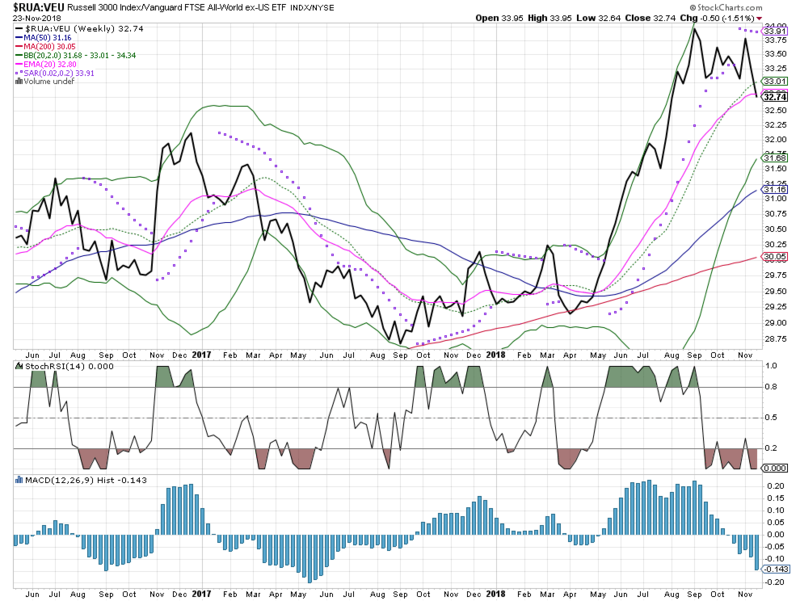 rates being moved too high or money supply and/or credit being made too restrictive). 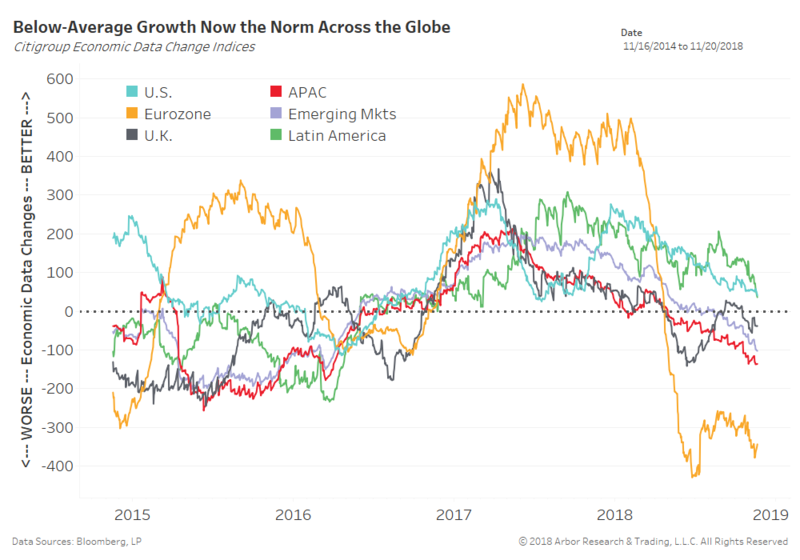 Today, investors see growing evidence that the slowdown outside of America’s borders is finally starting to impact the domestic economy, and understand that these headwinds are likely to be exacerbated by trade policy, and other political and geopolitical concerns. These factors combine with the diminishing benefits of last year’s huge fiscal stimulus program and a capacity-constrained economy (after the longest expansion in U.S. history) to create some powerful headwinds to economic growth. It is in light of these headwinds that there is a growing concern, in and outside of the Federal Reserve, that the Fed is once again at risk of going too far and causing at least a “growth recession” (a prolonged period of below-potential growth), if not a full-blown recession. This has significant implications for the equity markets, and is being reflected in both a dramatic reduction in profit expectations for next year and a very significant reduction in the multiples that investors are willing to pay for each dollar of reduced earnings. 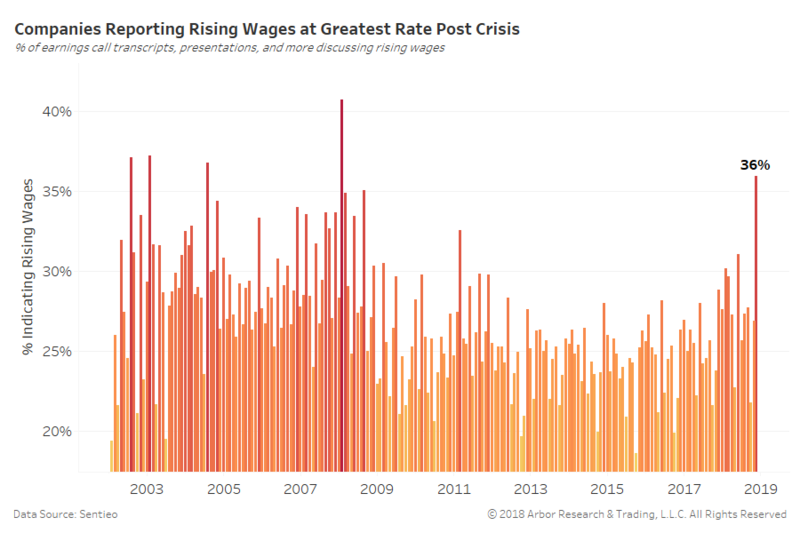 We believe that this sizable contraction in market multiples is indicative of a notable drop in risk appetite and financial speculation, which is important on multiple levels, starting with its implications for monetary policy. To explain, the Federal Reserve has been warning that it might need to move short-term rates above the “neutral” rate (where rates are neither stimulative nor restrictive), in order to dampen the financial excesses that built up because of both the excessive financial liquidity created by quantitative easing and the incredibly low volatility of the previous several years. We maintain that the course of U.S. monetary policy will likely be the primary determinant of financial asset prices over the near-to-intermediate term, and further believe that the Fed’s perception of imbedded risk and financial speculation will be a key determinant of whether they will be satisfied ceasing their rate-hiking campaign at the neutral rate (presumably a Federal Funds Rate of 2.5% to 3.0%), or if they will feel the need to push rates higher to some yet-to-be-determined level. As such, we believe that this topic is worthy of further analysis. In some regards, the Federal Reserve is a victim of its own success. At the Jackson Hole Economic Conference in late 2008, then Federal Reserve Chairman Ben Bernanke announced the first of several “quantitative easing programs” under which the Fed purchased trillions of dollars in U.S. sovereign debt and asset-backed securities with the dual goals of re-liquifying the domestic financial system and re-inflating the prices of both real estate and financial assets, as a means of creating a wealth-effect that would stimulate consumer spending and pull the domestic economy out of the “Great Recession”. They not only managed to engineer a recovery, but also one of the greatest equity bull markets in history. Over the period, investors also benefitted from both some of the lowest interest rates in history and some of the lowest levels of risk and statistical volatility in history, which combined to generate the levels of financial speculation that has recently produced numerous Fed warnings that they may ultimately need to put the economy at risk by driving rates high enough (above “neutral”) to wring out this speculative excess. In a speech on October 3rd of this year, Federal Reserve Chairman Powell drove this point home when he added that “we are a long way from neutral at this point, probably.” In our opinion, this single comment set off alarms throughout the world’s financial markets, as it conjured up images of the Fed unintentionally over-tightening once again, and sending the economy unnecessarily into recession. It ran contrary to what had been consensus investor expectations, and introduced an open-ended and unquantifiable risk into the markets. Yes, the Fed was highly successful when it used quantitative easing to “spike the economic punchbowl”. However, it now needs to take the punchbowl away, and it already faces hangovers from a variety of sources. First of all, its strategy of creating an environment where a limited number of financial assets were being chased by a seemingly unlimited supply of money created inflation in financial assets on a global basis. It is a phenomenon that is now at an inflection point, as the world’s central banks are slowly starting to drain this excessive liquidity that has been inflating the value of financial assets since the start of the Fed’s quantitative easing programs in 2008. It is little wonder that we are seeing prices fall on everything from stocks to bonds and from crypto-currencies to commodities. With a reduced supply of money chasing a growing number of financial assets, prices have been under pressure. In fact, according to a report just issued by Deutsche Bank, 2018 will be remembered as one of the worst years in history in regards to the percentage of financial assets (a whopping 89%) that have declined in value on a year-to-date basis. Indeed, according to this research, a higher percentage of financial assets have lost value this year than at any time since 1901. A second impact of all of the central bank-generated liquidity is that it catalyzed an environment of “one-way-risk”, where asset prices almost never declined, thus creating record-low levels of volatility which, in turn, encouraged investors to forget about risk, to employ leverage, and to move their portfolios out to the far extreme of the risk spectrum. Indeed, in the twelve months following the last presidential election, the average daily movement in the S&P 500 fell to just 0.31%, representing the calmest 12-month period in more than 50 years, according to the Financial Times, and the VIX Index, a measure of risk and volatility in the S&P 500, fell to its lowest level ever in July of last year. Further, in 2018, the S&P 500 has closed higher or lower by at least 1% on 51 different days thus far, which compares to only 8 times in all of 2017. Importantly, that is primarily a reflection of the period of low volatility that culminated in 2017, rather than particularly high volatility in 2018, as this year’s volatility is not that far removed from normal, with two declines of 10% in the S&P 500. According to Ned Davis Research, from 1900 to 2013, there were 123 corrections, which breaks down to an average of just over one 10% to 20% decline in the stock market per year. Over the same period, there were 32 bear markets, which means that the equity markets averaged a 20% or greater decline every 3.5 years. This time, 57% of the stocks in the S&P 1500 Composite Index fell more than 20% below their 52-week highs, as did 47% of all stocks in the S&P 500 Index. 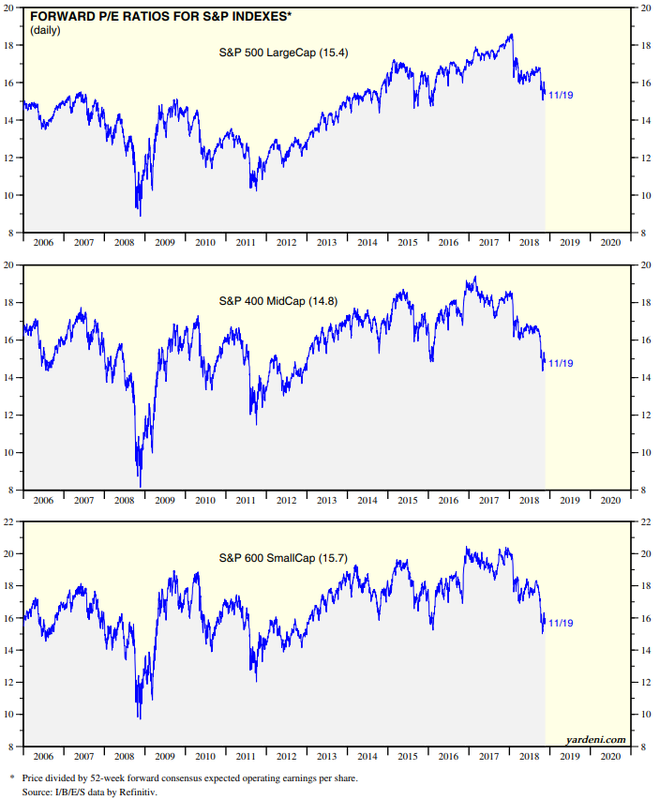 Even so, the S&P 500 Index itself barely declined over 10%, so the decline in the domestic markets has remained somewhat muted, particularly when compared to the carnage experienced overseas, where 63% of foreign, developed-market stocks (1,742 of 2,767) have fallen by at least 20%, and where 80% of emerging market stocks (919 out of 1,150) have declined by at least that sum. You can see the relative out-performance of the domestic markets in the above chart that divides an index of America’s 3,000 largest public companies by the Vanguard All-World (excluding the U.S.) Exchange-traded fund. The rising line indicates the out-performance enjoyed by the domestic markets from the start of the January decline until the beginning of November, since which time the foreign markets have generally outperformed. The third, albeit somewhat less immediate risk stems from the decision of the world’s central banks to not only dramatically expand the money supply and drive interest rates to near or below 0%, but also to leave that extraordinary stimulus in place for as much as 8 years past the point of recovery. That decision has created an environment where many companies that would have normally gone out of business or been taken over during a period of more normal monetary policy have been able to stay afloat by relying on historically low rates and increasingly lenient lending standards to finance operations. We do not necessarily view this as an imminent or out-sized risk. However, problems could quickly reveal themselves in the high yield debt, leveraged bank loan, and low-quality equity markets, if interest rates continue to climb or if the economy slows towards recession. In the meantime however, we believe that there is a very positive side to the severity and breadth of the decline that started in late September, which is that it has dramatically “lowered the bar” for the equity markets, starting with the fact that it has, in our opinion, removed much of the pressure from the Federal Reserve to drive rates beyond neutral in the name of unwinding what had been worrisome levels of financial speculation. 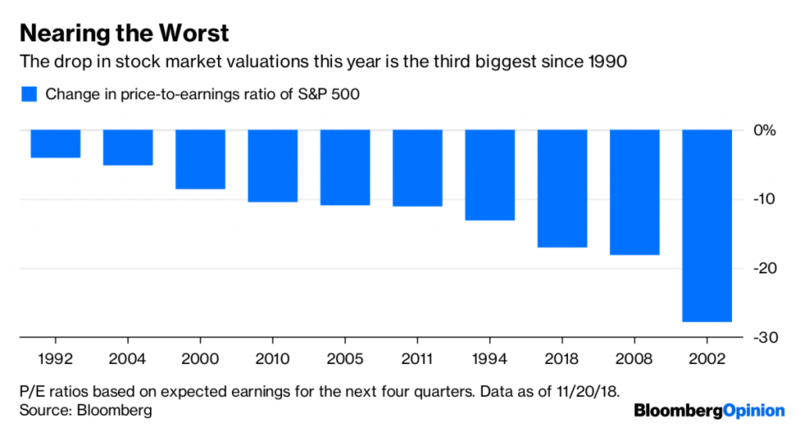 Indeed, when you consider that we have just witnessed the third largest decline in price-to-earnings multiples since Bloomberg started keeping that data in 1991, one could argue that Chairman Powell ultimately accomplished by jawboning the markets what he otherwise would have needed to do by moving interest rates above the neutral level. To put the recent 17% drop in valuations into some perspective, it is only 1% less than the 18% annual dive in valuations that took place in 2008, during the worst of the financial crisis. 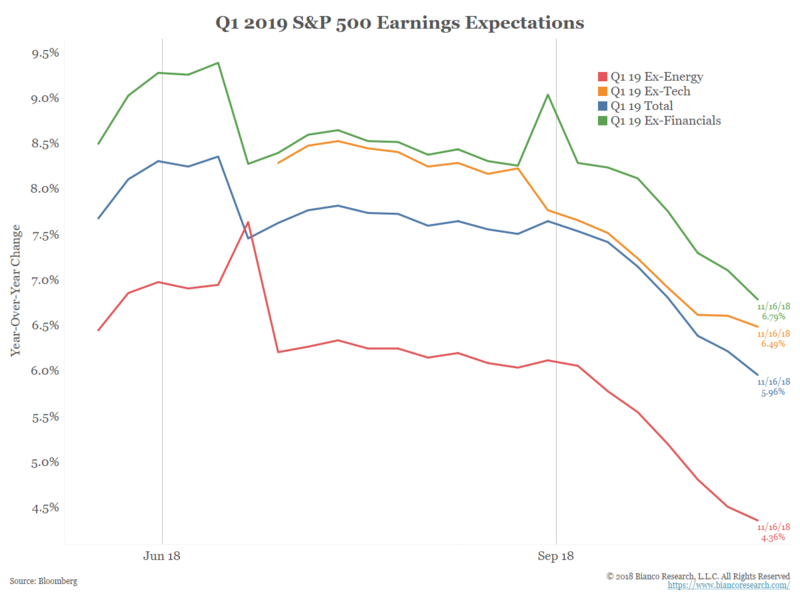 Economic concerns have combined with the waning benefits to earnings growth of last year’s tax cuts to dramatically depress expected earnings growth. However, the very fact that price-to-earnings multiples fell much faster than did prices themselves illustrates the kind of unwinding of excessive valuations and sentiment that may provide the Federal Reserve with what it needs to at least slow, if not stop outright, the current trend of rate increases, once they reach neutral, which is generally interpreted as being only between 0.25% and 0.75% above current levels. We believe that any related dampening in investor expectations for future monetary tightening would likely be very strongly celebrated by the equity markets. 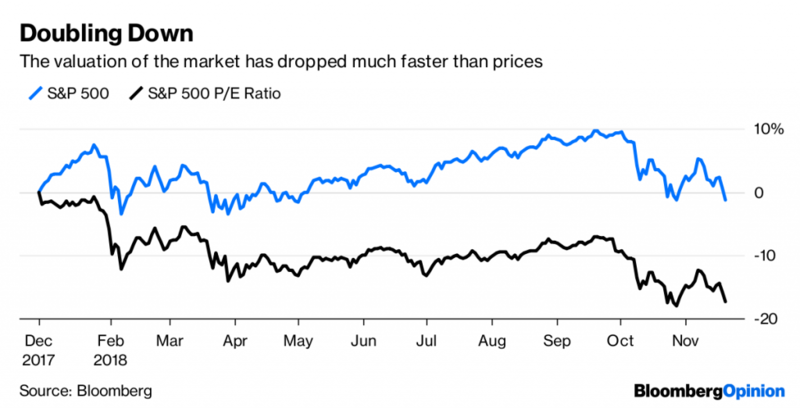 In the meantime, there has been a quite dramatic constriction of market multiples such that small and mid-capitalization stocks are now selling at well below the average of recent years, and even the multiple on the S&P 500 Index is at multi-year lows. While not inexpensive from a historical perspective, equity valuations are down sharply from the frothy levels of the third quarter, and actually seem reasonably valued in an environment where it seems increasingly possible that both short and long-term yields may not need to move too much higher. Indeed, over recent weeks, a number of voting members on the Federal Open Market Committee, including Chairman Powell and Vice-Chairman Clarida, have retreated from Chairman Powell’s previous hawkish statements, even going so far as to suggest that interest rates are already approaching the neutral rate. Inflation will be all-important. The dis-inflationary influences of a strong dollar, a weakening global economy and three years of Fed rate hikes should exert downwards pressure on inflation, while constraints on industrial capacity, one of the tightest labor markets in history, and the impact of tariffs on import prices should provide a powerful offset. The other major factor that can not only deflect Gretzky’s proverbial pass, but move the goal posts entirely, is America’s trade conflict with China, and this week’s meeting between Presidents Trump and Xi Jinping in particular. We do not anticipate an easy or quick resolution to this conflict, and fully expect for this to be a source of equity market volatility for months to come. That said, we would expect for an eventual resolution to catalyze a powerful rebound in global equities. In the meantime, it is noteworthy that company executives are finding great value in current equity prices, as is evidenced by the surge in insider buying (versus selling) among corporate executives. We tend to share their opinion, and believe that this ratcheting down of both equity valuations and interest rate expectations is likely to buy this equity bull market some more time. 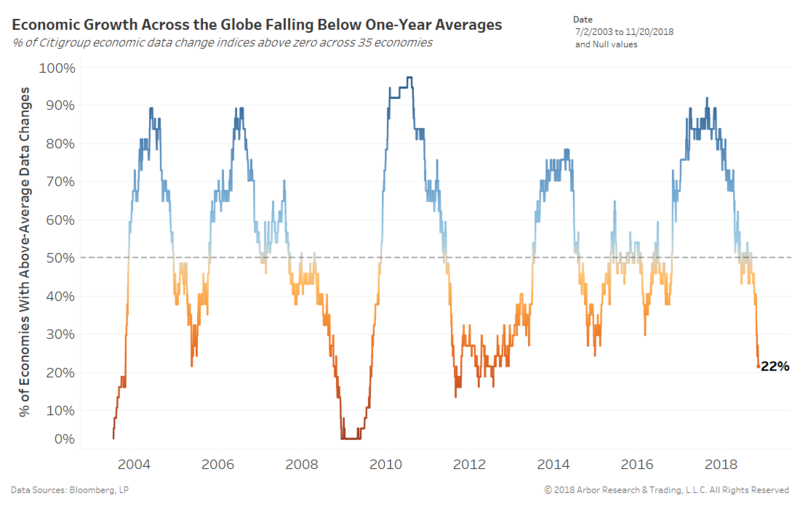 In many regards, the financial markets entered the fourth quarter in a precarious position, with future expectations for economic and earnings growth at likely unattainable levels. However, with valuations and sentiment now back to much more reasonable levels, we believe that the story is now primarily about macro-economic policies, including: 1) Will the Federal Reserve, as has been its history, become overly restrictive with monetary policy and catalyze a domestic recession? and 2) Will President Trump’s trade policies become overly aggressive and combine with the scheduled ending of Europe’s quantitative easing programs in January to create a significant drag on the global economy? With 75% of S&P 500 stocks down by at least 10%, and 45% of the index down by at least 20%, and with an interest rate outlook that is considerably less threatening than it was just a matter of weeks ago, we find ourselves rather favorably disposed to both the stock and bond markets at around current prices, and are looking for an entry point for equities, which we expect to evidence itself somewhere between the lows of October and the lows of last February. 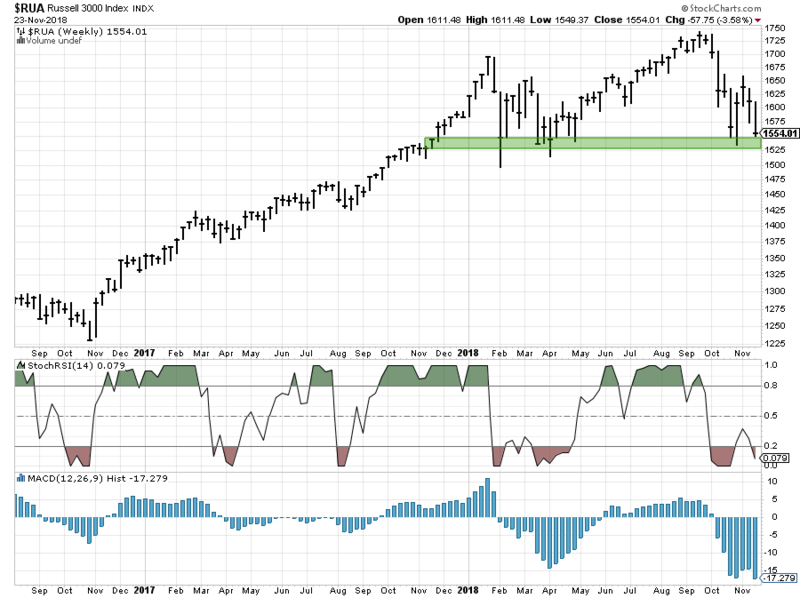 Depending on the index, we would expect to find support somewhere between 1% and 3% below current prices. That said, it is our expectation that any sustained breach below the February lows, any significant escalation of the trade conflict with China, or any significant increase in hawkish rhetoric from the Fed will likely at least call into question this relatively optimistic outlook. Advisory services offered through Per Stirling Capital Management, LLC. Brokerage services and securities offered through B. 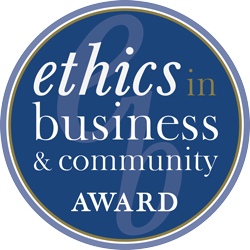 B. Graham & Co. Inc., member of FINRA/SIPC. Per Stirling Capital Management and B. B. Graham & Co. Inc. are separate and otherwise unrelated companies. This material represents an assessment of the market and economic environment at a specific point in time and is not intended to be a forecast of future events, or a guarantee of future results. Forward-looking statements are subject to certain risks and uncertainties. Actual results, performance, or achievements may differ materially from those expressed or implied. Information is based on data gathered from what we believe are reliable sources. It is not guaranteed as to accuracy, does not purport to be complete and is not intended to be used as a primary basis for investment decisions. It should also not be construed as advice meeting the particular investment needs of any investor. Nothing contained herein is to be considered a solicitation, research material, an investment recommendation or advice of any kind. The information contained herein may contain information that is subject to change without notice. Any investments or strategies referenced herein do not take into account the investment objectives, financial situation or particular needs of any specific person. Product suitability must be independently determined for each individual investor. This document may contain forward-looking statements based on Per Stirling Capital Management’s expectations and projections about the methods by which it expects to invest. Those statements are sometimes indicated by words such as “expects,” “believes,” “will” and similar expressions. In addition, any statements that refer to expectations, projections or characterizations of future events or circumstances, including any underlying assumptions, are forward-looking statements. Such statements are not guarantying future performance and are subject to certain risks, uncertainties and assumptions that are difficult to predict. Therefore, actual returns could differ materially and adversely from those expressed or implied in any forward-looking statements as a result of various factors. The views and opinions expressed in this article are those of the authors and do not necessarily reflect the views of Per Stirling Capital Management’s independent advisors. The Standard & Poor’s 500 (S&P 500) is an unmanaged group of securities considered to be representative of the stock market in general. It is a market-value-weighted index with each stock’s weight in the index proportionate to its market value. The Volatility Index (VIX) is created by the Chicago Board Options Exchange (CBOE). It is designed to produce a measure of constant, 30-day expected volatility of the US stock market, derived from real-time, mid-quote prices of S&P 500® Index (SPX) call and put options. The Standard & Poor’s 1500 (S&P 1500) combines the Standard & Poor’s 500 (S&P 500), the Standard & Poor’s Midcap 400 (S&P 400) and the Standard & Poor’s SmallCap 600 (S&P 600) indices into one. The S&P 500, S&P 400 and S&P 600 are used to track large-cap U.S. equities, midsized companies and the small-cap segment, respectively. Together, these three indices represent approximately 90% of the market economy. Past performance is no guarantee of future results. The investment return and principal value of an investment will fluctuate so that an investor’s shares, when redeemed, may be worth more or less than their original cost. Current performance may be lower or higher than the performance quoted.